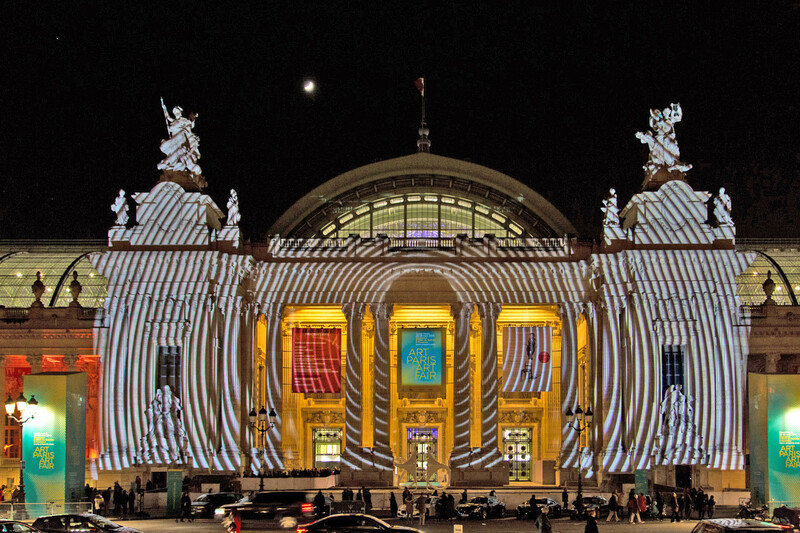 Dominic Harris: projection on Grand Palais's façade. A short note about Art Paris (26-28 march). Digital art is well alive under the high glass roofs of Paris Grand Palais. Two galleries lend a new impetus to digital creation: Charlot and Lelia Mordoch. Both present works with more colors and humor, not with new artists, but with seasoned authors of intact creativity. At Charlot, the surprise arises from a series of new works by Misha Margolis, combining natural textures with mobile forms in a quite innovative way. Several works, technically simpler, call for smiles by combination of screen actions with real material parts. Misha Margolis: the material tape and the digital tape as an illusion of continuity. Fun ! Charlot, due to a recent agreement with a partner, shows historical works side by side with the newest. Alignd on the same wall come for instance two of the last series by Antoine Schmitt and a diptych by Vera Molnar, both algorithmic, but one is hand made and the other computer generated. This expresses graphically the continuous development of digital/algorithmic art from its origins some 40 years ago up to its 2015 creativity. Fresh twigs (Schmitt) and deep roots (Molnar) at Galerie Charlot. At Lelia Mordoch's, Miguel Chevalier presents new works, notably Lilus Arythmeticus Evolution, an original combination of his vegetal generative structures with more abstract forms of multiplication, a 60 minutes evolving generative work. As always, a feast of colors and shapes, some more easy going than the more "formal" style of Schmitt for example. Chevalier also extends his range of 3D printed works, this time with a series of white sculptures illustrating digital plant growth by successive states, one could say "à la Muybridge". Alain Le Boucher : Hommage à Garcia Rossi. In this same gallery, Alain Le Boucher keeps on developing his highly demanding technique of LED's controlled by micro-controllers. But, for the first time, he adds color to his palette, making good use of new micro-controlled LED from the Chinese market. He comments : "We are on our way to the smart diode". - Impressive is Star Interactive, by Vincenzo Marsiglia, at Boesso gallery. - Olivier Waltman shows other works by Le Boucher, and also comparable LED works by Rémi Brun. - Jaccob+MacFarlane, an archiects studio, shows "The invisible drawings", a series of linear graphic works. 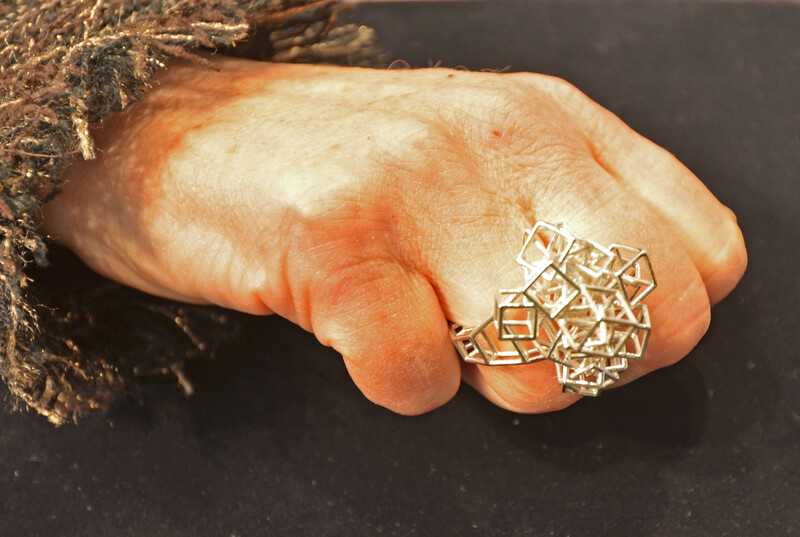 3D printed jewelry by Miguel Chevalier. - Gimpel & Muller present works by Vasarely, Cruz-Diez and Schoeffer. - Sarah Myerscough Gallery shows video by Dominic Harris. One of his works was projected by night on the Grand Palais's façade. - Bogéna gallery shows a large generative video by Teamlab. Chevalier : life growing in 3D printing. P.B. March 28, 2015, revised March 31. With thanks to the friends who sent corrections.